Last night, as Emma resigned herself to having to go upstairs for bedtime, she grabbed a dolly and we started up the stairs. I held one of her hands, and she paused for a minute to arrange her babyÂ so that the doll, which she was holding onto with her other hand,Â could ‘hold’ the stair rail as we ascended. It was all so sweet, and made me proud that this is what she has internalized about how we talk to her when she’s trying something new or challenging. I love my little daughter! Well, Emma’s been making some new friends, and she likes her teachers at the new pre-school daycare. I’ve been trying hard to prompt Emma with just the right questions to elicit from her some information about her days there, and sometimes, I get good information results.Â (The daily teacher’s notes on what she did that day are also a much appreciated source of information and comfort). So I’ve started asking about that, too.Â Last night, I asked about what is “yucky” at school.Â Turns out, “the table is yucky” because one of her little girl friends got “stuck” under there, apparently right when her dad came to pick her up.Â According to Emma’s telling, the girl must have been under the table when her father arrived, and, when she couldn’t get out from under it quickly, “she cried for her dad.”Â From what I can piece together, Emma imparted some blame for this situation on the table itself (although the girl’s dad helped his daughter to getÂ out right away).Â At some point during this melee, EmmaÂ “ran away from that.”Â (“That” being the suspicious table, I presume). Also, we had a lot of crying in the car this morning on the way to school.Â Emma REALLY wanted to stay home toÂ watch a particular Disney DVD.Â She did NOT want to be in her car seat, and did NOT want to go to her new school. When we arrived and parked atÂ school, I sat in the back seat with her to discuss just why she didn’tÂ want to go in. We talked about it being a good thing that the teacher was talking toÂ Aiden about not pushing, and about howÂ the teachers like Emma very much and take good care of her. At that point, I said we should go inside together and just see if there might not also be some fun and nice things about school, too. I thought it was nice that the teacher gave her some special attention and stayed with her forÂ a while getting her focused onÂ something interesting.Â (I saw them still there together several minutes later as I passed by again on my way out after checking on some other things). It turns out that we’re in the midst of a record-breaking winter here in Milwaukee. It’s been unusually, and bitterly cold, and since December, we’ve had snowstorm upon snowstorm regularly dumping multiple inches of snow on our fair city. My never-closes office even – (gasp) – closed one day last week due to a 10-inch-plus snowfall that was predicted, and came, that day. But in the midst of it all, and with sometimes wet, snowy shoes, we’ve managed to move into our new house, and are slowly settling in. Another recent change is that Emma has started at a new day care place. They give us a written report of her meals, nap timing, and other activities for the day. So we know that on her first day there, the teacher read “Suppertime for Frieda Fuzzypaws” and that Emma enjoyed “filling up and then pouring out sand from pink frying pan,” among other things. It’s sweet, sweet stuff.Â And makes the cold winter seem just a little warmer. Why have I felt so absentminded since I’ve been pregnant? Many pregnant women say their short-term memory isn’t up to par during pregnancy, particularly during their first and third trimesters. It certainly seems to make sense: In your first trimester, you may be distracted by thoughts about this new adventure you’re beginning or worries about your baby’s health, as well as exhausted and nauseated from the hormonal changes you’re undergoing. During your third trimester, you may be overwhelmed or just plain distracted by the huge life changes you’re about to experience and again exhausted if you’re having trouble getting a good night’s sleep. Research on pregnancy and memory is limited, so no one knows for sure what’s really going on. While some studies have found evidence of verbal and memory deficits during pregnancy, others have shown that pregnant women actually do just as well in cognitive tests as women who aren’t pregnant. 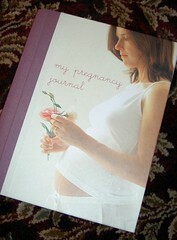 One study found that pregnant women did experience a decline in memory, but only in the third trimester. Interestingly, in a different study, pregnant women rated themselves as having performed worse than they would have before pregnancy, even though they tested just as well as a group that wasn’t pregnant. So if you think you’re flakier than usual while you’re pregnant, it may just be your perception. My OWN Doctor’s take on the subject is that pregnancy forgetfulness is a result of the hormones and is nature’s way of softening the edge (at least in hindsight) on some of the less pleasant aspects of pregnancy. Nothing wrong with forgetting the downside. And generally, I agree with this view. I found that, after Emma was born, the details of the pregnancy, and how I felt at what stages, kind of faded from view. That was well enough from my perspective, but it is hard to explain to expecting women who come to a pregnancy-veteran for advice that you can’t answer their question about how it was for you because you just can’t remember. Anyway, the forgetting aspect is one of the things that makes me so glad that I kept a pregnancy journal throughout those days carrying Emma. And now that I’m pregnant again – and once again have those kinds of issues on the mind – I figure this is as fine a time as any to share some of the highlights from that journal. So I’ll be doing that – over the coming weeks. It’s already interesting to see where some of the ways I’m feeling about the new baby (and about pregnancy, generally) are the same as, and different from, they were during the first go-round. Generally speaking, this time, there is a virtual absence of anxiety about the many unknown changes (physical, emotional, household- and work-related) that the birth of a first baby brings. There’s also a dull sense of dread mixed with determined stoicism, though, at how the physical part will get more challenging before it gets better – although I no longer have any fears about the actual birthing process. Beyond that, my current tale is just one of hormones. Lots of hormones. Lots of emotion and more tears at trivial stories than usual. Pregnant women should not be allowed to watch Hallmark Commercials or to listen to an interview on the radio in which Benedictine Nun, Sister Joan Chittister, recounts some of her poignant childhood memories. ItÄôs nice to have a long weekend. My firm is closed today and tomorrow. IÄôll be going in the afternoon, though, just to catch up on the mounting piles of obligations. But for now, I have the morning off from the office. Emma is napping at the moment. Before that, and all with her help, I fed her breakfast, tidied toys, and folded and put in new loads of laundry. After that round of activity, I could use a nap, too. But instead, I have succumbed to the lure of turning on a soap opera (for the first time since maternity leave). Not much time for philosophizinÄô on the blog, lately. IÄôve been too busy keeping up with a very active almost-toddler (who has eight teeth, by the way. And she can say Äúuh-ohÄù and ÄúeowÄù [in response to hearing the catsÄô mewing]). She has the independent spirit of a toddler now, which is most evident when I try to get her to hold still when I change her diaper or – to her horror – put clothes on her. Inevitably these days, she ends up, naked, across the room from the diaper/dressing staging area. I have to go catch her, and use ever more sophisticated techniques to get her to stay still long enough just to fasten two diaper tabs. It sounds much easier than, in fact, it is. On the other hand, sheÄôs so busy crawling around, exploring, transporting favorite toys from place to place, that when sheÄôs tired, she very very tired; like a young puppy that runs around in seemingly endless circles only to then fall into a deep and uninterruptible sleep. Yesterday, she nearly fell asleep during her lunch. We had to stop the feeding, mid-meal, so that she could lay down for a long nap. 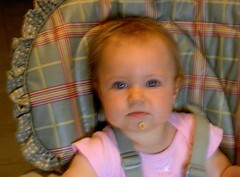 But just before that, I got this picture of her – she had no idea that she had inadvertently stuck a Cheerio onto her chin. Cats, Your Food’s Got Nothin’ On Peas! 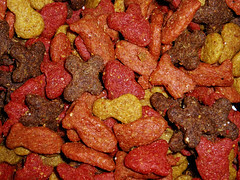 There have been no additional cat food ingestion incidents at our house after the one I wrote about last weekend. Instead, we’ve managed to steer her toward¬other, more approriate foods. Last week, she got really excited about feeding herself Cheerios. This week, we’re right in the thick of riding that wave to transition from all pureed foods to a variety of other finger foods, like toast, cut up fruit, chunks of hash brown patties heated up in the toaster, and, tonight, green peas! This evening, as an accompaniment to some Gerber “3rd Foods” Spaghetti with Meat Sauce (visible on her cheek and bib), hash brown chunks, and banana baby yogurt (visible on her chin) that we helped her to eat for dinner, Emma fed herself peas. Lots and lots of peas. 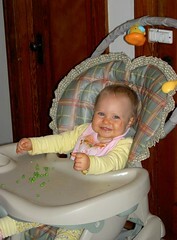 Posted in Baby Chronicles, Parent Odyssey | Comments Off on Cats, Your Food’s Got Nothin’ On Peas! We try to be vigilant about keeping crawling Emma away from the cat’s food bowls on the floor in the kitchen. But today, she got a few morsels in her hand and I didn’t notice. Then she ate one. I saw the chewed up bits of it in her mouth. It was a triangular piece of Science Diet Hairball Formula Light. 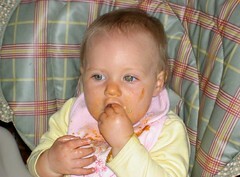 I’m sure it didn’t taste quite like (her favorite snack)¬a Cheerio. 1. New Mommy Hair, by Koog Family. Once a woman stops nursing, for whatever reason, her body starts shedding hair. I’m not talking about a little bit. I’m talking about gobs and gobs coming out in the hairbrush and in the shower. I’m talking about my stylist having a very concerned look on her face and telling me, “there’s just not as much there as there used to be.” I’m talking about the fact that I used to barely be able to squeeze my thick pony tail into a large barrette. And now, if I don’t use a small tiny one, it slips out. I probably lost fifty percent of my hair, if not more. The good news is that it is growing back. The new growth is about an inch and a half long now. When I wear a pony tail, the new stuff groups together into little flippies that kind of look like horns coming out from the side of my head. It’s strange. But it’s normal. Other mothers¬at work confirmed that they experienced exactly the same thing. 2. This Book Makes Me Cry, by Koog Family. 4. Tiny Baby, by Koog Family. I hadn’t realized that a parent’s attention to a child is so grounded in the moment. I’m so aware of what Emma does every day, and I take in and adapt to each change as it comes along. But that focus keeps me from remembering many of the details of her earlier stages. Paul and I looked at some of her early baby pictures last night, and reacted with stunned laughter to her amazing smallness and her difference from now! We can’t clearly remember that, as we’re following her around the house, now, to keep up with her crawling. 1 additional trip to the pediatrician. Don’t sleep all the way through the night. Bake at 350 until mixture browns and clean toothpick inserted reads . . .
You are currently browsing the archives for the Parent Odyssey category.